The 49.9 metre Overmarine motor yacht Moonraker, listed for sale with Moran Yacht & Ship, has been sold with Allied Marine introducing the buyer. Built in GRP by Overmarine, Moonraker was delivered in 2014. With naval architecture by Overmarine, her exterior was designed by Stefano Righini. 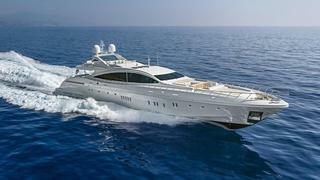 Moonraker is the eighth hull in the Mangusta 165 series and was commissioned by her owner to replace his previous yacht of the same name. Moonraker is different to the previous Mangusta 165s as she boasts seemingly endless main deck windows, where other yachts in the series have signature teardrop windows. Her flybridge was also restyled with built-in furniture to create a better flow. The interior of Moonraker was also penned by the yard, but deviates from the form of her sister ships. Inside, the entertainment area on the main deck is brightly lit thanks to the huge side windows and skylights above the dining table. Entertainment is a key focus on Moonraker, with a cinema room on the lower deck featuring a 65-inch TV and secret candy drawers for the most authentic of movie theatre experiences. The room is furnished with a deep wall-to-wall plush sofa and two large leather armchairs. This yacht can accommodate 10 guests in four cabins, all located in her lower deck, with crew accommodation aft. The full-beam master suite has a broad bathroom amidships. The three en-suite guest cabins have queen size beds and an extra cabin can be created in the cinema room. Elsewhere on the lower deck, Moonraker has a state-of-the-art gym with a hammam, steam shower and en-suite facilities.